Children aren’t money-savers by nature. If they receive some money as a gift or for completing their chores, they likely may want to spend it on the first thing they can think of if they have not yet learned how much fun it can be to save money. 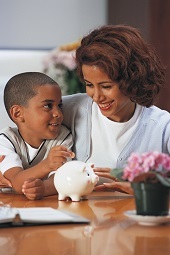 Early on, it is important for parents to begin teaching kids to save money. One of the best ways to develop a child’s interest in saving money is to provide incentives while at the same time teaching the value of the action. Matching your child’s dollars saved. If a bank were to tell you that it was willing to match the amount of money that was in your savings account in 20 years, you’d probably be inclined to save as much as possible. In the same vein, you may want to consider some kind of “matching dollars” incentive to encourage your child to save more. For example, agree with your child on a specific length of time for him or her to save money without spending any of it. This could be for as little as a month or else for multiple months if your child receives a weekly allowance and depending on your goals. At the end of the time period, if your child has saved without spending, you could match that amount and add it to your child’s savings, while reemphasizing why learning to save can be both fun and rewarding. Inspiring your child to save for a desired item. For birthdays or holidays, your child may ask for certain gifts that are more expensive than others. Instead of purchasing all of the high-priced items, tell your child that you’ll buy only one or two, and ask him or her to save money to buy the other item. Take time to spell out why you think it’s important for your child to save up for the desired item. Provide examples of items that you currently have to save for, and that he or she will have to save for in the future. If the item in question is one that your child really wants, he or she will likely be more willing to save up for it and enjoy meeting the challenge. Tracking savings growth with your child. Rather than leaving your child in the dark about the savings process or exactly how long it will take to save for an item, offer him or her a full scenario. For example, by using Excel or PowerPoint, you could create graphs or charts to help illustrate saving, especially if you know that your child is a visual learner. By tracking with your child how fast his or her savings grow, your child will have a clearer understanding of how saving works and how long it can take to reach a desired goal, and be able to view the saving process in a positive way. Although teaching kids to save money can be a challenge, it doesn’t have to be. By providing incentives for your child to save money, he or she can become more receptive to saving and to grasping why the concept of saving is an important life skill.